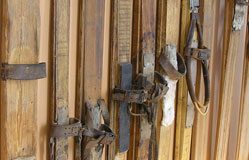 In 1927 Karl Gruber and his partner Gregor Andreoli started manufacturing and selling skiing and mountaineering equipment in a small cabin at the site of the present store. In a relatively short time the small shop developed into a small business employing 10 artisans. Twenty years later, in 1948, a new building was inaugurated with plenty of space to host the store and the workshop. 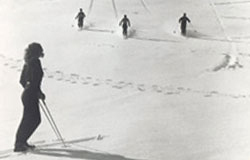 A few years later, with the construction of the Diavolezza cable way, Pontresina's Winter business was greatly improved. In the 60s the management of the store was handed over to Karl's son Erich and his wife Heidy. 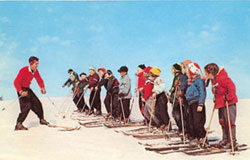 During that time Erich was also the head of the Pontresina Ski School. Later he was elected Mayor of Pontresina for 23 years and Representative for the Upper Engadine in the Cantonal Parliament. During the 70s, the decade of the tourism boom, Gruber Sport gradually improved to meet the growing demands of the clientele. During the late 80s the business was taken over by Erich's sons Andy (then head of the Pontresina Ski School) and Reto (likewise skiing instructor). Following the family tradition they started offering new services to their clients. The generational change went smoothly thanks to the commitment of everybody evolved. Six years later Reto left the firm and the management passed to his brother Andy. Since then Andy and his wife Heidi have led the growing business with up to 16 staff members. In 2008 the store was completely renovated and expanded. The new spacious facilities were built in only 9 ½ months. Gruber Sport works in the "champions league" of sports stores. The new store is a great success and is truly appreciated by our customers. We are open for you all year round! Gruber Sport: "Always well served".